This series of seven advertorials was created for New Hampshire’s Department of Travel and Tourism and ran in the Boston Globe. The goal: To appeal to New Englanders in search of a winter getaway. The series was produced by Rumbletree advertising agency. Two samples are included below. Here’s a secret – tubing is not just for kids. Go ahead, try it. Scrunch yourself down into one of those giant inner tubes. Whoosh! With one giant shove, you’re off down the hill, face to the wind, eyes watering, laughing and hollering. New Hampshire in winter is a great place for kids – of all ages. Local ponds become busy skating rinks. The manicured grounds of a Shaker museum become an ideal site for a winter hike. Woods roads become snowmobile trails or routes for horse-drawn sleigh rides. There are winter carnivals and moose festivals, scenic train rides and ice sculpting demonstrations. Hot cocoa and hot air balloon rides. During winter in New Hampshire, you can even walk on water. A pair of snowshoes will carry you across a frozen lake to explore an island. Or you can venture out under a full moon for a woods hike. When fingers and toes get chilly, head inside for more fun. Kids can navigate a submarine or play their own music at the Children’s Museum of Portsmouth, pick up crabs or search for flounder at the Seacoast Science Center. Journey to the stars and back at the Christa McAuliffe Planetarium in Concord. Watch a blacksmith at work at the Northern Forest Heritage Park in Berlin. And what better excuse than the chill of winter to come inside and sample some delectable goodies? There are mid-winter chocolate festivals in the White Mountains and the Dartmouth/Lake Sunappe Region and maple syrup tours and tasting in the Great North Woods and the Monadnock Region. How about a visit to an old-fashioned candy store in the Lakes Region? Or a giant ice cream sundae buffet – slathered with homemade toppings? Inside or out, there’s plenty of fun for the whole family this winter in New Hampshire. For a year-round vacation kit, call 1-800-FUN-IN-NH, ext. 202. What better way to spend a winter evening than settled at a cozy corner table, the one near the fireplace? Candlelight casts soft shadows. Wide pine boards creak underfoot as waiters come and go – warm soup, fresh bread, a host of entrees, an impossible choice of desserts. Settle in. Savor the taste of winter in New Hampshire. Granite State cuisine can be as elegant as a five-course meal served by tuxedo-clad waiters, as simple as a mug of steaming cappuccino at a local cafe. No matter what you crave – gracious service in an 18th-century inn, a quirky all-night breakfast joint, or a low-beamed, brick-walled pub – you can find it in New Hampshire. Dine on a restored tugboat or behind bars in a former jail house. Discover a genuine Italian trattoria in an clapboard farmhouse or gather for a sumptuous meal in a Shaker village. Try Japanese food in a former bank or traditional American fare in a one-time textile mill. In a grand old hotel at the foot of the White Mountains, step onto the dance floor between courses and swing to the sounds of big-band music. 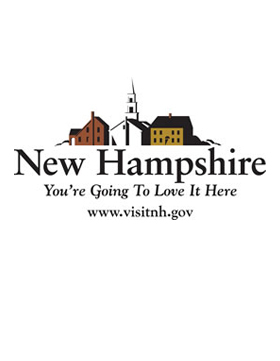 New Hampshire offers a bit of just about everything–one-of-a-kind Main Street eateries and downtown delis, ethnic cuisine and traditional New England fare, romantic tables for two and family-friendly restaurants. So head for somewhere warm and welcoming this winter – head for New Hampshire. We’re sure you’ll be back for seconds. For a year-round vacation kit, call 1-800-FUN-IN-NH, ext. 202.